often feature a pair of legs like this example. talents, and culinary skills of the wa ke de are called upon to properly welcome and celebrate the masquerade spirits. analogy that honors the hostess, and women in general, as a source of food and life. I CURRENTLY DO NOT HAVE A DAN SPOON IN MY COLLECTION. or mia is the name for any large ladle (Fischer and Himmelheber 1984,123). The wunkirmian is owned by the wunkirle, who is considered the "most hospitable woman" of her village quarter. wunkirle (1965). She offers hospitality to all who come to her door, nor is any group too large for her to feed. herself must work long and hard to plant and harvest an abundance of rice. sing her praises (Himmelheber and Tabmen 1965,174). important men. Later the portions of the cow will be distributed to be cooked and eaten by all. 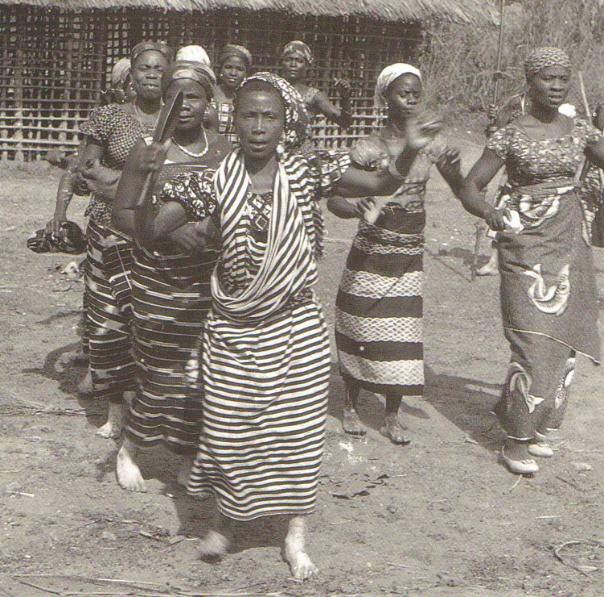 Among the Dan, after an old wunkirle dies, a festival usually is given to honor her and to inaugurate her successor. occasions a sizable distribution of foods and gifts to her village and guests. wunkirmian is given an individual name, e.g. Piase, "Fine face," or Mlanyor, "Lucky Woman" (interviews 1986). a meeting of wunkirmian spirits in the bush (Negerkunst, 1960,166). carved in several different forms. The most common form has a handle carved in the likeness of a human head. 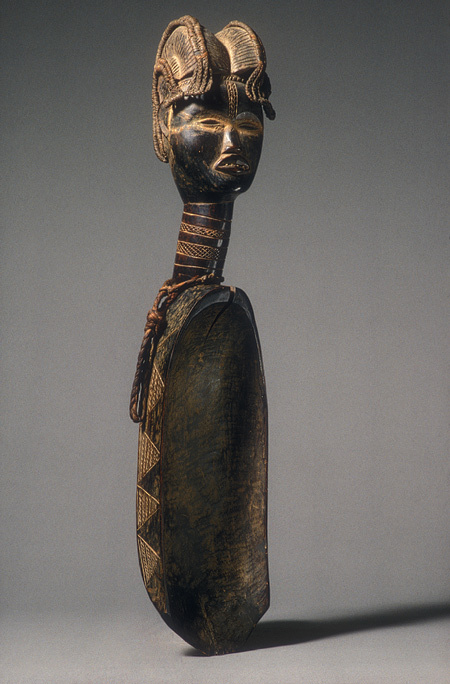 around the neck at the base of the head, and vertical lines are carved in eyebrows to represent cosmetic plucking. The neck often has incised rings, representing neck creases, which emphasize the beauty of a long neck. 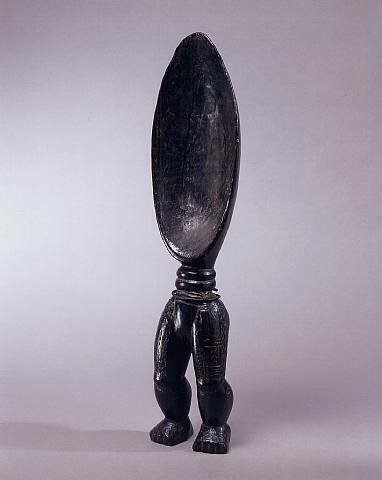 the back of the handle was carved the portrait of her favorite helper in feast preparation, Nying Gli, "Dry your tears"
are said to represent the legs of all the people arriving on foot to be fed by the wunkirle (Woto Mongru 1983). 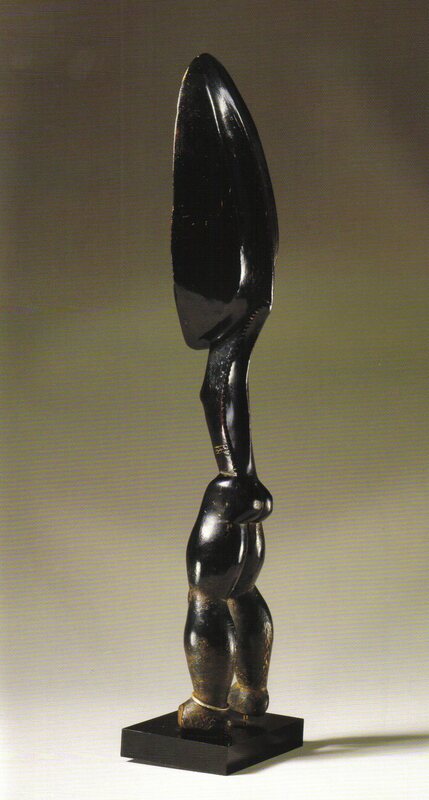 Other handle forms include the human hand, said to represent the strong grip of the wunkirle (Woto Mongru 1983). a number of abstract designs. Source: "Four Dan Sculptors - Continuity and Change"
given the honor of preparing the feast, followed by her assistants (Barbier, ed. 1993: 72). 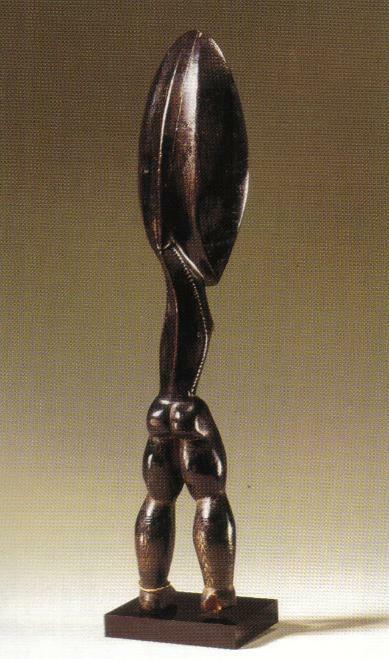 anthropomorphic nature of the spoon. calves, thighs, and torso; exceptionally fine and varied blackened patina. 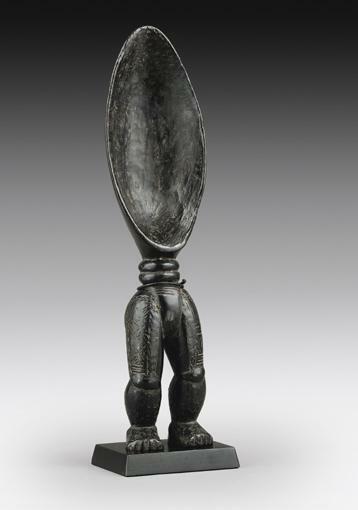 called 'the spoon spirit' (Fischer and Himmelheber, 1984:123). decoration in the form of scarification and incised notches serve to highlight the overall form. 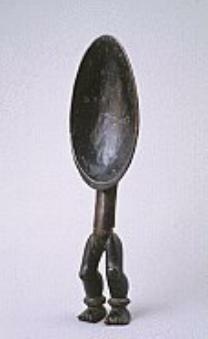 and ladle with incised linear motifs imbued with kaolin; varied dark brown patina. 24 3/16 x 6 7/16 x 2 13/16 in. exceptionally fine and varied encrusted blackened patina overall. decoration highlights the very anthropomorphic nature of the spoon. GALLERY: Merton D. Simpson Gallery, Inc.